BBDO has a new plan to attract some of the best industry talent, retain some of its highest performers and, in the long run, benefit its clients by sending seven employees on a 13-week study abroad-inspired exchange program. 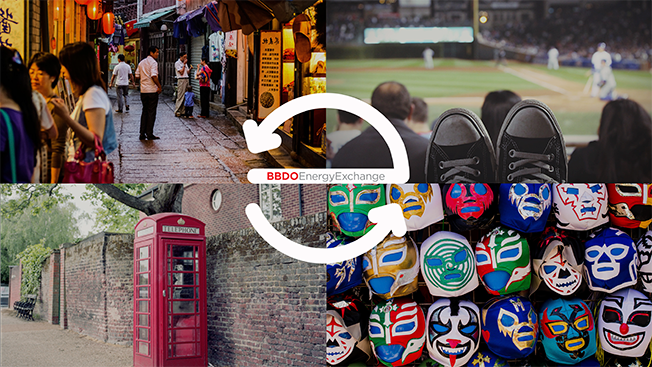 The BBDO network recognized some key benefits college students get through studying abroad, from appreciating and learning about different cultures to pushing themselves outside of their comfort zones, and decided to apply a similar model with its BBDO Energy Exchange program, which kicks off this summer. For the first round of exchanges, BBDO selected seven employees—three account leaders, two planners and two producers—from four different agencies within the network to complete the 13-week program, which concludes at the end of August. Any employees interested needed to be high performers in the agency with four to five years of industry experience and at least one year at a BBDO office. "As we were thinking about putting something like this together, the first objective was to create an unparalleled growth opportunity for our people. We know that the best talent want to go farther faster in their careers. This is an idea to really help them do that," Tonise Paul, president and CEO of Energy BBDO, told Adweek. The four agencies participating in the first wave of BBDO's Energy exchange include Energy BBDO in Chicago, BBDO Mexico, AMV BBDO in London and BBDO Shanghai. The locations were selected with the idea that the offices would be "geographically dispersed," Paul said. "We knew we had like-minded leaders in those locations who would be very excited by the opportunity and put some energy into it," she added. The goal is to not only attract some of the best talent in the industry, but to also strengthen the agency's talent pool for global business. "Today, the agencies with the most diverse, global citizens and culture will win," Paul said. Another major benefit according to Paul is that those participating in the program get to see that no matter where they are in the world, BBDO agencies everywhere are all about "The Work, The Work, The Work." Currently, there are two employees in Chicago, two in London, two in Mexico and one in Shanghai. Along the way, the seven participants will catalog their experiences both in a private Facebook group—sharing photos, videos and stories with other BBDOers—but will also be asked to keep ongoing diaries and blogs about the adventures they have along the way and some of the best practices they pick up from other BBDO agencies around the world.